Prerequisite: Zodiac Swim 12 or equivalent. 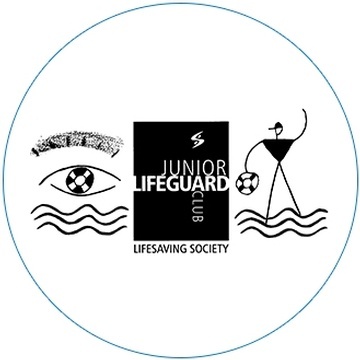 The Junior Lifeguard Club offers a fun introduction to the exciting world of lifeguarding for kids who want to stay active in the water and have completed Zodiac Swim 12. The JLC focuses on skill development using personal-bests to determine achievement. Participants work toward improving swimming skills, lifesaving skills, fitness, leadership, and teamwork skills. Members participate in activities that are similar to real lifeguard training exercises in a controlled, safe and enjoyable setting. Effort and success are recognized with Recognition and Award Seals when a participant meets personal goals and sets personal bests. The Junior Lifeguard Club is designed for a serious purpose but the process is pure fun! Every club member will receive an Official Junior Lifeguard Club WaterLog in which to record achievements and keep Recognition and Award Seals. In Level 1, swimmers continue stroke improvement with 25 m swims of front crawl, back crawl and whip kick. Fitness improves in 100 m workouts, 25 m sprints and introducing touch and go turns. 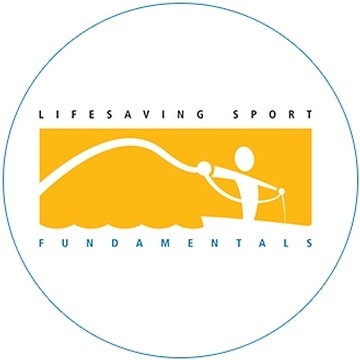 Lifesaving sport skills include the ability to hit a target with a rope, movement with flippers, swim underneath an obstacle, secure a rescue tube to a manikin and treading water while supporting an object. Swimmers develop an understanding of playing fair. Participants should be comfortable in the deep end, be able to swim 25 meters and tread water for 45 seconds. Prerequisite: Zodiac Swim 9 or equivalent. Synchronized swimming is an exciting aquatic program option for those who love swimming, gymnastics and dance. This creative, routine based synchro orientation program is designed to develop basic synchro skills while increasing existing swimming skills. Over the course of the session, participants will develop a sequential routine set to music to showcase their swimming and synchro skills. Recreational synchronized swimming teaches skill development, provides an opportunity for interpersonal relations in both individual and group components, and provides a FUN and exciting aquatic activity! All new participants will receive a nose clip at their first class. Prerequisite: Completed Zodiac Swim 8 or equivalent. This program is designed to teach competitive swim skills in a non-competitive environment. Zodiac swimmers will have the opportunity to experience a team environment. Swimmers will be introduced to competitive skills in a recreational setting. Their overall endurance and swimming skills will be improved throughout the session. Swimmers will learn and improve upon the four competitive strokes (freestyle, backstroke, breaststroke and butterfly). The participants will also be introduced to different training techniques that include racing starts and turns. They will be encouraged to track their personal best times and participate in team relays. Required Equipment: Participants must bring their own mask and snorkel. 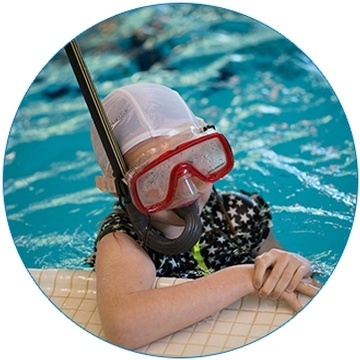 This program is a fun and exciting way for children to learn how to safely explore underwater environments. Participants will learn appropriate care and use of a snorkel, mask and fins. Material covered includes safe snorkeling practices, rescue techniques and what to do when a problem arises. Top this off with some fantastic underwater games and you have an underwater adventure waiting to happen!